Today was the first Sunday since the surgery that both our kids went to their classes without any trouble and stayed the whole service! I had been actually dreading another attempt and had told Matthew I didn’t think we should even try for Sundays. But he was playing in our churches new venue (Amped Two Rivers Church) and I really wanted to go to at least the worship part. So I got up with the kiddos and prayed for God to make things smooth for us. Judah woke, showered, took all his medicine and ate breakfast without a fight…which doesn’t ever happen. Cricket was her usual jolly self but I was worried about the time cause the 10:40 service is nap time. However, as God had shown up for me with Judah’s morning, He did the same for Camilla Kate. When we got in the car I explained to Judah that we were gonna go to the big service and he started crying. I asked him what was wrong and he said, but I don’t want to go to church I want to go to my class! I was shocked as the last 2 times I tried to take him were awful. He just got overwhelmed with the noise and number of kids. But God heard my prayer this morning. He made my morning smooth. Both my kiddos behaved and were great in class and I got to go to worship AND listen to the sermon. Thank you God for caring about me and the longings of my heart. 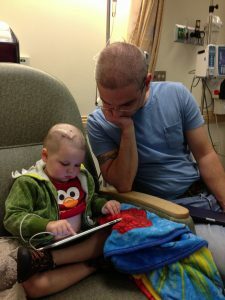 Please continue to pray for Judah as he goes back to his full Chemo regiment next week. Pray for no nausea, neuropathy, or balance issues. His balance is our biggest concern right now as he keeps falling down. He fell into a bookcase over Labor Day weekend and then last week he tripped on nothing and busted his lip wide open. Little guy is having a hard time. Thankfully the black eye, bruised cheek and forehead are fading and his lip is healing faster than I thought possible. Other than the falls, it’s been a good week. Thank you for praying and please continue to do so.